Most kids who play with toy trains lay their track in a circle. Cole Fleming lays his in the shape of a U—just like the track of his favourite subway line. Cole was only four years when he first became fascinated by the subway. That’s when his mother, Teresa, started taking him to music classes. To get there, Cole and his mother rode a bus that stopped near their house, which dropped them off right at the subway entrance. From there, they took an escalator underground, to where subway trains run deep beneath the city streets. Cole liked sitting in the front car and looking out the window as the train made its way down the tunnel. He became very interested in how buses and subways worked. Whenever he could, he’d ask the people who drove the bus and subway lots of questions, and remembered all the things they did to make their vehicles move. “I think pretty soon he became more interested in the ride than in going to music class!” says Cole’s mother. Cole lives in Toronto, a city with three subway lines, about a dozen streetcar routes, and lots and lots of buses. Together, these subways, streetcars, and buses make up the Toronto Transit Commission, or T.T.C., the city’s public transportation system. Public transportation is an important way of helping people get where they need to go, and each type of vehicle plays a different role. By running underground, subway trains avoid traffic and can move people over long distances very fast. Streetcars are a little like subways trains: they move along tracks, but they’re not as long and they run on the road. Streetcars are less expensive to operate than subways, and can still carry a lot of passengers, so they’re most helpful in busy downtown areas. Buses don’t carry as many people, but because they don’t run on tracks, they can go places subways and streetcars don’t reach. They’re especially useful in areas where fewer people live. All three forms of public transportation help passengers move around without having to use a car, and fewer cars on the road means less pollution and less traffic. If everyone travelled where they needed to go in a car, there would be so many cars on the road that no one would get anywhere! That’s why public transportation is especially important in big cities. As Cole got older, he remained curious about public transportation. When he was six, Cole became friends with Joel, a bus driver on the route near Cole’s house. Cole always sat at the front of Joel’s bus so he could see what buttons Joel pressed and what levers Joel pulled. Joel could tell Cole was very interested in how his bus worked, and he always answered Cole’s questions. He explained to Cole how he got his bus-driver’s licence, how long he had to practise to become a good bus driver, how to open the bus’s door, and how to lower the bus to make it easier for people to get on and off. One time, he even let Cole make an announcement over the bus’s loudspeaker. 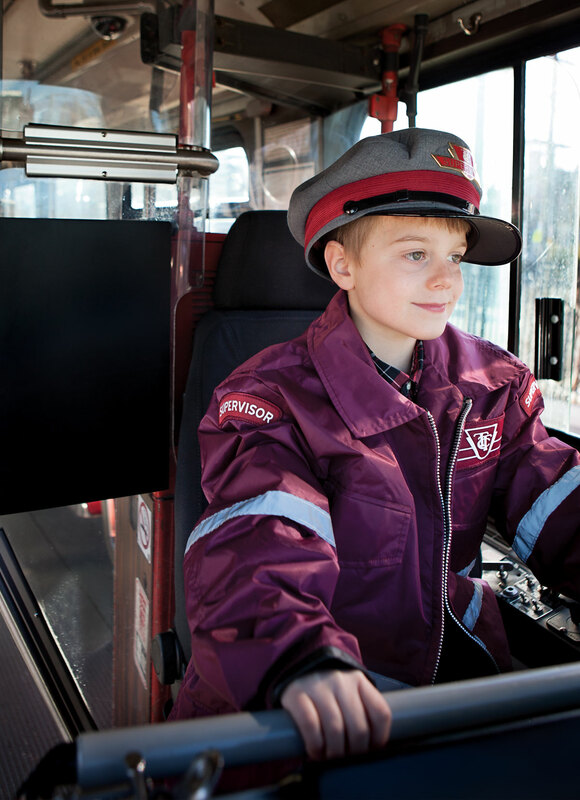 Cole wished the other passengers a good morning, welcomed them to Joel’s bus, and thanked them for using the T.T.C. When Cole started school and was about to get his first report card, he asked his mother if anyone ever gave Joel a report card. Cole’s mother told him she didn’t think so. “So how would Joel know if he’s doing a good job?” Cole asked. So Cole and his mother decided to let the T.T.C. know what a great bus driver Joel was. With his mother’s help, Cole wrote an E-mail to Andy Byford, the man in charge of the Toronto Transit Commission. To Cole’s surprise, Mr. Byford wrote him back. He said he was happy to hear what a good job Joel did every day. In fact, Mr. Byford was so pleased to get Cole’s letter that he made sure it was read out loud at a meeting of other people who worked for the T.T.C. “It was exactly the kind of letter we want to see from our young riders,” says Mr. Byford. Becoming a bus driver isn’t easy. Just ask Joel Pinsk. By the time Joel started working for the Toronto Transit Commission, in 2008, he already had years of experience driving lots of different vehicles, including motorcycles and race cars. But Joel still had to spend several weeks studying, doing homework, and writing tests before being allowed behind the big wheel of a bus. After five years of driving a bus, Joel was promoted to a job supervising other bus drivers, and today he trains new employees on the T.T.C.’s bus simulator, among other things. Joel says teaching other people how to be safe drivers is the job he always dreamed of—that’s why he’s always happy to answer questions from curious passengers like Cole. “Cole knows a lot of stuff because he’s pretty inquisitive and pretty observant,” says Joel. “If you show a major interest in what you do, you’ll excel at it.” And if anyone is proof of that—it’s Joel!